We’d love your help. Let us know what’s wrong with this preview of Gödel's Proof by Ernest Nagel. In 1931 Kurt Gödel published his fundamental paper, "On Formally Undecidable Propositions of Principia Mathematica and Related Systems." This revolutionary paper challenged certain basic assumptions underlying much research in mathematics and logic. Gödel received public recognition of his work in 1951 when he was awarded the first Albert Einstein Award for achievement in In 1931 Kurt Gödel published his fundamental paper, "On Formally Undecidable Propositions of Principia Mathematica and Related Systems." This revolutionary paper challenged certain basic assumptions underlying much research in mathematics and logic. Gödel received public recognition of his work in 1951 when he was awarded the first Albert Einstein Award for achievement in the natural sciences--perhaps the highest award of its kind in the United States. The award committee described his work in mathematical logic as "one of the greatest contributions to the sciences in recent times." However, few mathematicians of the time were equipped to understand the young scholar's complex proof. Ernest Nagel and James Newman provide a readable and accessible explanation to both scholars and non-specialists of the main ideas and broad implications of Gödel's discovery. It offers every educated person with a taste for logic and philosophy the chance to understand a previously difficult and inaccessible subject. To ask other readers questions about Gödel's Proof, please sign up. 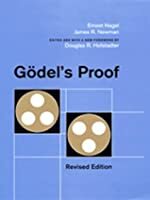 Highly entertaining and thoroughly compelling, this little gem represents a semi-technical but comprehensive and mathematically accurate elucidation of the famous (and so often misused and misunderstood) Godel's meta-mathematical results concerning the limits of provability in formal axiomatic theories. Being relatively short, this book does not expand on the important correspondences and similarities with the concepts of computability originally introduced by Turing (in theory of computability, Highly entertaining and thoroughly compelling, this little gem represents a semi-technical but comprehensive and mathematically accurate elucidation of the famous (and so often misused and misunderstood) Godel's meta-mathematical results concerning the limits of provability in formal axiomatic theories. Being relatively short, this book does not expand on the important correspondences and similarities with the concepts of computability originally introduced by Turing (in theory of computability, particularly in the theory of recursive functions, there is a fundamental theorem stating that there are semi-decidable sets (sets which can be effectively generated), that are not fully decidable. In fact, this is nothing but the Godel's first theorem expressed in computational terms. As expressed beautifully by Chaitin, uncomputability is the deeper reason for incompleteness). Moreover, there are a couple of areas there there is really a bit of too much hand-waving (for example, I would have loved a much more detailed treatment of the critical “Correspondence Lemma”, and of fundamental concepts such as that of “model” of a theory), but I must say that this book achieves the remarkable result of condensing the core of Godel's theorems in a succinct but very readable, approachable, meaningful and informative way, even including important technical details that allow the user to get a better understanding than what normally offered by most other semi-technical books on the subject. The reader can get, for example, a quite good appreciation of the genius of Godel's approach, who understood that mathematics is a universal medium for the embedding of patterns or structure of any sort, so that statements seemingly about numbers alone can in fact encode statements about other universes of discourse, including meta-mathematics itself. Godel managed thus to achieve what the authors call the “arithmetization of meta-mathematics” whereby a meta-mathematical statement about formal expressions, and their typographical relations to one another, may be construed as a mathematical statement about the corresponding Godel numbers and their arithmetical relations to one another: meta-mathematics is therefore faithfully mapped into the domain of integers and their properties. And it is precisely by using this fundamental result that Godel could demonstrate his celebrated theorems. 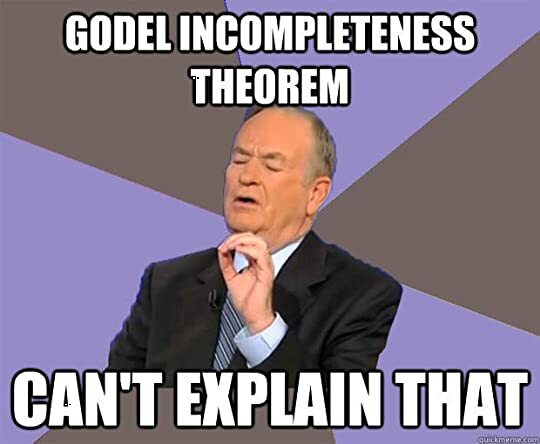 Godel's incompleteness theorems are about formal provability in a finitistic sense within a specific class of formal systems, rather than about "provability" in an informal sense, or even about provability in mathematics in general. Moreover, while there are several global properties that a formal system may have (such as completeness, consistency, and the existence of an effective axiomatization), the incompleteness theorems only show that systems which contain a “sufficient amount of arithmetic” cannot possess all three of these properties at the same time. In particular, it is important to highlight that, far from stating that every system is or will be found inconsistent, Godel’s incompleteness theorems merely place limits on what consistent systems can prove (including the intriguing matter of their own consistency, of course). - secondly, the Godel incompleteness theorems must also be put in their correct overall context: while any post-modernism-bent reader can mention Godel's incompleteness theorems (with more or less accuracy), not many are aware of the important Gentzen's proof of consistency of formal systems such as PA, achieved using the (admittedly non finitistic, therefore not satisfying Hilbert's original stipulation of his aims) principle of transfinite induction. Metamathematical arguments establishing the consistency of formal systems such as ZFC have been devised not just by Gentzen, but also by other researchers. For example, we can prove the consistency of ZFC by assuming that there is an inaccessible cardinal. But, of course, Godel's theorems imply that this can't be turned into a proof inside ZFC itself, because ZFC can't prove the hypothesis that there is an inaccessible cardinal. In general terms, we can't prove the consistency of any sufficiently powerful given formal system from within such system. - thirdly, not many are aware of the Godel's completeness theorem. This important result states that any (first-order) theorem which is true in all models of a theory must be logically deducible from that theory, and vice versa (for example, in abstract algebra any result which is true for all groups, must be deducible from the group axioms). - last but not least: the ultimate confirmation that formal systems such as ZFC provide a consistent and normally sufficiently powerful formal system able to generate adequate mathematical structures for the satisfactory representation of the patterns ultimately characterizing the physical world, is available in the very experimental results of the physical sciences, as famously condensed by Wigner in his treatise about the “unreasonable effectiveness of mathematics”. This is, of course, not an absolute apriori proof of consistency, as originally dreamt by Hilbert, but it is quite an important consideration that should not be forgotten either. Considering all the above, it is my strong view that, rather than proving any supposed epistemological limitations of mathematics, Godel's theorems actually clearly highlight the infinite, inexhaustible richness of the patterns, structures and truths that mathematics can offer – structures and patterns that are also reflected in, and can faithfully represent, the inner core of physical reality. Mathematics is, informationally speaking, infinitely powerful - it can't be compressed into a limited, finite set of axioms from which all the mathematical truths can be derived. How can anyone wrap oneself around that ancient paradox? A true statement whose unprovability resulted precisely from its truth! With this self-undermining formula as his hammer, Godel knocked down the fortress of Principia Mathematica (PM), so painstakingly constructed by Russell and Whitehead. He also showed that his method applied to any system whatsoever that tried to accomplish the goals of Principia Mathematica. In effect, then, Godel destroyed the hopes of those who This Statement is False. He also showed that his method applied to any system whatsoever that tried to accomplish the goals of Principia Mathematica. In effect, then, Godel destroyed the hopes of those who believed that mathematical thinking is capturable by the rigidity of axiomatic systems, and thus were mathematicians, logicians, and philosophers pushed headlong into a mysterious newly found chasm irrevocably separating “provability” from “truth”. The Heart of Godel’s Argument: The Formal K.O. (i) Godel constructed a formula G of PM that represents the meta-mathematical statement: ‘The formula G is not demonstrable using the rules of PM’. — This formula thus ostensibly says of itself that it is not demonstrable. (ii) Godel also showed that G is demonstrable if, and only if, its formal negation (not) G is demonstrable. However, if a formula and its own negation are both formally demonstrable, then PM is not consistent. Accordingly, if PM is consistent, neither G nor (not) G can be formally derivable from the axioms. In short, if PM is consistent, then G is a formally undecidable formula. (iii) Godel showed that though G is not formally demonstrable, it nevertheless is a true arithmetical formula. (iv) Since G is both true and formally undecidable (within PM), PM must be incomplete. In other words, we cannot deduce all arithmetical truths from the axioms and rules of PM. We are thus compelled to recognize a fundamental limitation concerning the power of formal axiomatic reasoning. For anyone inclined to believe that the essence of mathematics (or any other science) is purely formal axiomatic reasoning, this must come as a shocking revelation. Godel’s paper is notoriously difficult. Forty-six preliminary definitions, together with several important preliminary propositions, must be mastered before the main results are reached. But, as we can see (I have tried to faithfully use phrasings from the book throughout this ‘review’), this superb presentation provides the lay reader with just enough material to get an idea about the central argument and its beauty. I don't read much math these days, so when I do read it, it's a little like climbing a steep wall following a winter of sitting in front of a computer. You discover a lot of soreness in muscles you scarcely remember you ever had in the first place. The long and the short of it is that once upon a time, I sorta understood Godel's incompleteness theorem, and after this modest reading, I sorta understand it again. Success! More importantly for me, it was fun to try to connect neurons in my poor fuzzy I don't read much math these days, so when I do read it, it's a little like climbing a steep wall following a winter of sitting in front of a computer. You discover a lot of soreness in muscles you scarcely remember you ever had in the first place. More importantly for me, it was fun to try to connect neurons in my poor fuzzy brain, and for a math aficionado, entering a world where it's assumed that conclusions are merely the logical consequences of initial assumptions and nothing more is a bit like diving into mom's meatloaf -- familiar and comforting. Godel's theorem itself is supposedly the big revelation that upset the 19th century mathematics apple cart. As the authors explain, his proof showed that "no final systematization of many important areas of mathematics is attainable," a potentially unsettling proposition. But it may be a somewhat comforting assertion. Who would want to have it all figured out anyway? And gravity still works, and the sun still comes up every day, so I think we'll all get by. As for its readability, math forever has a big problem in that it's *designed* to simplify reason, so when it itself becomes very complex, it can be difficult to impart. By the same reasoning, if you try to simplify a very complex proof, leaving out a lot of the messy details while trying to explain the rest in plain English, you're necessarily going to miss a lot and there will be important details that are missing. In this book, the concepts are simplified and the details are left out. On the plus side, it's pretty readable for a math book, and the main conclusions are pretty easy to follow. On the minus side, there will necessarily be points to question. They do have a lot of footnotes, which offers some middle ground. My thanks to AC for convincing me to take the plunge and purchase this little gem: who'd have thought that one-hundred-and-thirteen pages of mathematical logic could have been so entertainingly informative? It was little touches like the chess analogy for describing the relationship between mathematics and metamathematics, the placing of the Richard paradox in terms that were more pellucid than the valiant effort attempted by Rebecca Goldstein, and the tricky, but effective, explanation of how G My thanks to AC for convincing me to take the plunge and purchase this little gem: who'd have thought that one-hundred-and-thirteen pages of mathematical logic could have been so entertainingly informative? It was little touches like the chess analogy for describing the relationship between mathematics and metamathematics, the placing of the Richard paradox in terms that were more pellucid than the valiant effort attempted by Rebecca Goldstein, and the tricky, but effective, explanation of how Gödel Numbers were mapped, and how they were further configured to perform their quite amazing feat of transposing metamathematical statements about the formal mathematical calculus into the formulas of the calculus itself. What's more, the appendix led me to dive into the slippery spaghetti of a more in-depth examination of the principles of logical inference and tautologies in absolute proofs. A wonderful book, one which I am surprisingly happy to have read. Perhaps now I'm ready for DFW's tour of infinity! Ce livre comporte trois ouvrages distincts. Premièrement un texte de vulgarisation visant à présenter le théorème d'incomplétude de Kurt Gödel, et à expliciter autant que possible pour le tout venant comme moi les grandes étapes du raisonnements, ainsi que les techniques employées par Gödel. C'est pas mal, les notions sont introduites par degré, les grandes étapes sont exposées, ainsi que les techniques employées. Il me semble que l'on vise un public de philosophes plutôt que de matheux. En secon Ce livre comporte trois ouvrages distincts. Premièrement un texte de vulgarisation visant à présenter le théorème d'incomplétude de Kurt Gödel, et à expliciter autant que possible pour le tout venant comme moi les grandes étapes du raisonnements, ainsi que les techniques employées par Gödel. C'est pas mal, les notions sont introduites par degré, les grandes étapes sont exposées, ainsi que les techniques employées. Il me semble que l'on vise un public de philosophes plutôt que de matheux. En second, la démonstration de Gödel elle-même, concise mais élaborée et touffue. Ce genre de démonstration, on ne les comprends correctement qu'à partir du moment où non seulement on parvient à les refaire soi-même, mais en plus on a très bien assimilé les fondements sur lesquels il s'appuient: ici, ma patience ne va pas jusque là, et j'ai plutôt parcouru rapidement le texte que mis ma cervelle à l'alambic. Enfin, un texte d'un logicien français contemporain, assez acerbe et grinçant, dont j'ai le sentiment que le but est de dégonfler l’intérêt un peu exagéré que ce fameux théorème a pu susciter dans les sciences humaines, en soulignant d'ailleurs qu'il est fort peu important en mathématique, logique ou informatique. Ce genre de propos est en ligne avec ce que j'avais pu lire de Jacques Bouveresse, dans son "prodige et vertige de l'analogie", dans lequel il s'indignait de l'usage philosophique de notions mathématiques hors de leur cadre d'application strict. Ce qui le font invoquent le doit à la métaphore, mais on peut aussi à bon droit les soupçonner d'imposture si la notion prise pour image est non pas une chose claire et évidente pour tous, mais un concept difficile qui en impose par son obscurité. Comparaison n'est pas raison. Pour expliquer rapidement, au début du siècle dernier, la logique a exploré des moyens de fonder les mathématiques de manière toujours plus rigoureuse, en formalisant les concepts afin de se dégager des pièges potentiels des ambiguïtés du langage naturel. En particulier, le jeu consiste à pouvoir construire toute l'arithmétique simple à partir d'un très petit nombre de règles logiques évidentes de base, et uniquement celle là: des axiomes. On peut donc construire des proposition générales, par composition et juxtaposition de ces axiomes généraux, mais inversement, on se demandait s'il était possible de construire des propositions vraies quand on les évalue, mais qu'on ne pouvait pas réduire à ces axiomes. Le théorème prouve que c'est le cas, après avoir modélisé précisément ces fameuses propositions construites mécaniquement. در مورد اثبات گودل صرفا حرف زده بود و دانش یا دید بیشتری به من نداد..ولی در مورد شخصیت گودل،خوشحالم که قسمت دوم.کتاب رو خوندم. The Book is the best to explain Godel's Proof of the Incompleteness Theorem. Gödel showed that Principia, or any other system within which arithmetic can be developed, is essentially incomplete. In other words, given any consistent set of arithmetical axioms, there are true arithmetical statements that cannot be derived from the set. Godel showed that it is impossible to give a meta-mathematical proof of the consistency of a system comprehensive enough to contain the whole of arithmetic—unless the The Book is the best to explain Godel's Proof of the Incompleteness Theorem. Godel showed that it is impossible to give a meta-mathematical proof of the consistency of a system comprehensive enough to contain the whole of arithmetic—unless the proof itself employs rules of inference in certain essential respects different from the Transformation Rules used in deriving theorems within the system. Such a proof may, to be sure, possess great value and importance. However, if the reasoning in it is based on rules of inference much more powerful than the rules of the arithmetical calculus, so that the consistency of the assumptions in the reasoning is as subject to doubt as is the consistency of arithmetic, the proof would yield only a specious victory: one dragon slain only to create another. A few examples will help to an understanding of Hilbert’s distinction between mathematics (i.e., a system of meaningless signs) and meta-mathematics (meaningful statements about mathematics, the signs occurring in the calculus, their arrangement and relations). Consider the expression: 2 + 3 = 5 This expression belongs to mathematics (arithmetic) and is constructed entirely out of elementary arithmetical signs. On the other hand, the statement ‘2 + 3 = 5’ is an arithmetical formula asserts something about the displayed expression. The statement does not express an arithmetical fact and does not belong to the formal language of arithmetic; it belongs to meta-mathematics, because it characterizes a certain string of arithmetical signs as being a formula. if we wish to say something about a word (or other linguistic sign), it is not the word itself (or the sign) that can appear in the sentence, but only a name for the word (or sign). According to a standard convention we construct a name for a linguistic expression by placing single quotation marks around it. Our text adheres to this convention. It is correct to write: Chicago is a populous city. But it is incorrect to write: Chicago is tri-syllabic. To express what is intended by this latter sentence, one must write: ‘Chicago’ is tri-syllabic. Likewise, it is incorrect to write: x = 5 is an equation. We must, instead, formulate our intent by: ‘x = 5’ is an equation. Here's my more personal review. I'm a functional programming guy that studied mechanical engineering. I've had exposure to a bunch of applied math, but pure math, and proof in particular, have always scared me. I've been trying to deal with this by reading about abstract algebra, category theory, working through blog posts and tutorials... none of this has really caught. I have better context for what it means to "study math", but I'm still nervous. 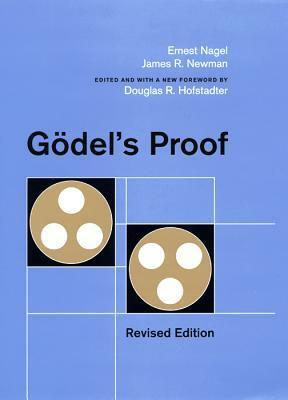 "Gödel's Proof" was one of the first books in my fall "Learn Math" program. All my "attempts" at getting into higher level math and proofs have failed due to skimming. It's hard to go deep into a result without context, of course, but it's also hard to rack up a list of dozens of definitions, try to wade through them on Wikipedia, and end up far from the original goal. I was inspired by Cal Newport's pitch on the benefits of deep, methodical study of a small topic. As a computer science graduate student, he went out and bought an expensive lab notebook, and each week does a deep, deliberate reading of a single paper and lays out its conclusions in his own words in his notebook. This book seemed a perfect place to start. The authors take a really difficult paper, expand the discussion out to a hundred pages or so, and provide all the context you need to wrap your head around the main arguments. - What it means for a system to be "sufficiently powerful"
- What phrases like "theorem", "proof", "demonstration", "decidable", "complete" etc really MEAN when discussing formal systems. I read "The Little Prover" (https://www.goodreads.com/book/show/2...) right before "Gödel's Proof". If you want some practice in using a language like Scheme to play with some of the concepts of formal proof, and try to implement a language like Principia Mathematica, I'd recommend cracking "Little Prover" next. The first 80 pages are a breeze, but pages 80-92 need many re-reads. P.S. Remember to not miss-use the incompleteness proof to give sweeping and profound statements about nature of the world or other mumbo jumbo. Godel went to a great deal of trouble to write a very exact and general proof, do not desecrate his work to prove weird stuff. Untuk sebuah karya (pemudah) matematik, buku ini sebenarnya sangat mudah untuk dibaca; lebih mudah daripada apa yang aku bayangkan. Aku fikir, ada dua sebab: (1) penulis berjaya memberikan gambaran jelas tentang apa yang Godel telah usahakan, dan penulis telah abaikan sejumlah pembuktian formula yang ia rasakan tak perlu; dan (2) aku membaca buku ini dengan maksud meninjau apa yang Godel katakan, dan bukan kenapa apa yang Godel katakan itu benar. Jadinya, sepanjang pembacaan, aku tidak begitu te Untuk sebuah karya (pemudah) matematik, buku ini sebenarnya sangat mudah untuk dibaca; lebih mudah daripada apa yang aku bayangkan. Aku fikir, ada dua sebab: (1) penulis berjaya memberikan gambaran jelas tentang apa yang Godel telah usahakan, dan penulis telah abaikan sejumlah pembuktian formula yang ia rasakan tak perlu; dan (2) aku membaca buku ini dengan maksud meninjau apa yang Godel katakan, dan bukan kenapa apa yang Godel katakan itu benar. Jadinya, sepanjang pembacaan, aku tidak begitu terganggu dengan (1). Nampak macam gempak, tapi sebenarnya kalau kau baca dari awal sampai akhir dan fahamkan maksud bagi setiap simbol, ungkapan ini sebenarnya bawa maksud yang ringkas sahaja. Maksudnya ringkas tetapi pembuktian dan kesannya agak mencabar untuk difahami. Aku fikir Bab 5 saja bacaan aku terbantut sebab kena renung dan kena semak forum-forum di Internet untuk faham dengan lebih lanjut. Pendekatan aku dalam membaca buku ini ialah, pada bab-bab awal, terima saja seperti seorang anak yang baru belajar bahasa asing. Tidak perlu aku persoalkan kenapa 'air' ialah 'water' dan bukan 'fire' dalam bahasa Inggeris. Tapi aku tidak nafikan kemungkinan aku silap dalam memahami bahasa baru ini. MENGAPA AKU BACA BUKU INI? Sebab aku fikir Teori Ketaklengkapan Godel (TKG) ini mempunyai suatu nilai epistemologi, iaitu memperihalkan kerapuhan andaian aksiomatik sesuatu sistem pemikiran. Bagaimanapun, hakikatnya Godel tetap seorang ahli logik-matematik yang tidak membawakan perbahasan falsafah melainkan pembuktian matematik yang ada sedikit nilai kefalsafahannya. Justeru, TKG ini, setakat yang aku faham, hanyalah pemerihalan tentang kemustahilan untuk mendirikan sebuah dasar aksiom kepada sistem yang arithmetik dan merangkumi nombor-nombor natural. Bukan semua sistem diserangnya, bahkan dalam salah satu forum yang aku layari, dikatakan bahawa TKG ini tidak menyerang lapangan Geometri pun. Aku fikir sepatutnya buku ini dapat tiga bintang, tapi sebab banyak buka mata, tambah lagi satu. How do I come up with a fair review for this book, without having my judgement clouded by the genius of Godel? On one hand I am speechless by the ingenuity of the proof devised by Godel and what it signifies, while on the other I am disappointed with the authors for how insufficiently the legend's mind has been probed and represented in these pages. For a book named Godel's Proof, this one barely scratches the surface. On the plus side, it was a very involved and difficult topic, and it was a bol How do I come up with a fair review for this book, without having my judgement clouded by the genius of Godel? On one hand I am speechless by the ingenuity of the proof devised by Godel and what it signifies, while on the other I am disappointed with the authors for how insufficiently the legend's mind has been probed and represented in these pages. For a book named Godel's Proof, this one barely scratches the surface. On the plus side, it was a very involved and difficult topic, and it was a bold undertaking by the authors to present it in a form consumable by the layman. They painstakingly laid the groundwork, chapter by chapter, assuming no prior knowledge in mathematical logic on part of the reader. Before plunging into the crux of the Proof, the context is presented in an elaborated and easy to understand way. This part of the book is a priceless gem for any newbie to the discipline of formal logic in deductive systems. Laudable is also the mathematical rigor maintained throughout, despite the requirement of keeping it friendly and comprehensible. On the negative, it barely met the expectations that I set out with. I sat through the earlier pages, consuming the wonderfully comprehensive background, only to find a fleeting glimpse at the actual proof. It is at best a superficial walk-through that doesn't even follow Godel's original line of reasoning. Excellent explication of Godel's proof. I appreciate both the simplicity and accuracy of the account this book gives, and the fact that it does not take Godel and make ridiculous assertions about what is suggested by his conclusions, using Godel to endorse a vague mysticism or intuitionism. Wonderful book. This book makes you feel smart for understanding (a dumbed-down version of) the proof of Gödel's incompleteness theorem. قضیه گودل نشان میدهد که هرچقدر خواسته باشیم ریاضیات را با فرمالیزه کردن به بند دراوریم، باز از بند میرهد. در واقع هرچقدرهم به سیستم اصول موضوعی متنوع مجهز باشیم و در اضافه کردن اصول جدید هم مختار باشیم، باز گزاره هایی وجود خواهند داشت که نمیتوان درستی یا نادرستی آن را در این سیستم از اصول موضوع به روش فرمال اثبات کرد. قضیه گودل نمیگوید که ریاضیات از عهده فهم ما خارج است (رویکردی نا امیدوارانه) بلکه بیان میکند که نمیتوان ریاضیات را محدود به روش خاصی کرد و نگاهی تک بعدی(فرمال) به آن داشت (رویکردی قضیه گودل نشان میدهد که هرچقدر خواسته باشیم ریاضیات را با فرمالیزه کردن به بند دراوریم، باز از بند میرهد. در واقع هرچقدرهم به سیستم اصول موضوعی متنوع مجهز باشیم و در اضافه کردن اصول جدید هم مختار باشیم، باز گزاره هایی وجود خواهند داشت که نمیتوان درستی یا نادرستی آن را در این سیستم از اصول موضوع به روش فرمال اثبات کرد. قضیه گودل نمیگوید که ریاضیات از عهده فهم ما خارج است (رویکردی نا امیدوارانه) بلکه بیان میکند که نمیتوان ریاضیات را محدود به روش خاصی کرد و نگاهی تک بعدی(فرمال) به آن داشت (رویکردی امیدوارانه). ریاضیات بسیار فراتر از ابزارهای محدودی است که با آن قصد فهم کاملش را داریم. همواره ناشناخته هایی در ریاضیات وجود دارد که نیاز به خلاقیت هست تا آن را بشناسیم. Até a parte preliminar à explicação da prova de Gödel eu entendi, já quanto a prova em si... nãããããooo. 1ª. **Consistência de um sistema**. Dado um sistema formado por um conjunto finito de axiomas, provando-se que esse sistema jamais produzirá teoremas contraditórios, então o sistema é consistente. 2ª. No fim das contas (que contas!) a prova de Gödel mostra que, se um sistema é consistente ele terá algumas proposições verdadeiras que não podem ser demostradas nem negadas. Além disso Gödel mostrou que um sistema não pode provar sua própria consistência, a não ser que ele seja inconsistente. 3ª. O teorema da incompletude abre portas para discussões na área de filosofia da matemática e teoria dos números, como: é possível um computador pensar como a mente humana? Qual o limite para a mente humana? Para tentar responder essa perguntas, ou não, irei ler GEB! If you have watched the movie “Inception” and thought it was not bad, then there is a higher chance that you will like this book. I would also give this book another name: “Gödel’s Trick in two parts, Part 2: proof by inception”. An imaginary “Part 1” refers to what has been omitted, i.e. the proof of why the correspondence between activities in different levels of inception is guaranteed to be valid. However, this point does not at all undermine the fact that this is a great and fun book, and a If you have watched the movie “Inception” and thought it was not bad, then there is a higher chance that you will like this book. I would also give this book another name: “Gödel’s Trick in two parts, Part 2: proof by inception”. An imaginary “Part 1” refers to what has been omitted, i.e. the proof of why the correspondence between activities in different levels of inception is guaranteed to be valid. However, this point does not at all undermine the fact that this is a great and fun book, and a must-read for lay readers like me to find an entry point to the original proof. So I will talk about the fun part first and the omission last. Below are all my interpretations of the text which may not be true due to personal limitations. What is it all about? Gödel’s proof is the proof against something, so that we must first understand the “something” and what property of it poses an interesting question. This “something” was elaborately introduced in the first half of the book: the agenda of Principia Mathematica (PM), to formalize/assimilate all mathematics into logic, where every truth statement can be expressed within PM can be deduced according to the Rules of Inference from the axioms, i.e. PM would be complete. To prove against it is to show that PM is incomplete, e.g. to find a true statement expressed within PM that is not deducible from the axioms. This idea of a proof include two key pieces: (1) this statement, say “s”, cannot be deduced from PM axioms, and (2) s must at the same time be true within PM. First, how can we prove a statement without deduction from the axioms? The example shown in Gödel’s proof is, in my word, “proof by unprovability”. Let s=“s cannot be deduced from PM axioms.”. If s is provable in PM, it is the same as saying “s can be deduced from PM axioms”, which is a formal negation of s, and hence created a contradiction. If s is not provable in PM, then it is saying that “s cannot be deduced from PM axioms”, which just proved s. Well, this is my version of blatant oversimplification of the solution to (1) by cheating, since, for example, “provable” belongs to the language of meta-mathematics and does not belong to PM, then s is not in PM. Even if we pretend that s is in PM, we cannot deal with (2), meaning we cannot show s is true by a similar way of cheating. However, even though PM does not speak the language of meta-mathematics, it does speak about numbers. Then what about translating meta-mathematical statements into arithmetical statements? That’s what he did. The object of meta-mathematical statements are PM formula, and the object of arithmetical statements are numbers. Therefore, we must map PM formulas onto numbers, and thus close of self-referential loop. Okay, then follows the most exciting part of Gödel’s trick, so no more spoiler - you must read the book. As mentioned at the beginning, part of the trick was omitted from the text. We said we would map formula to numbers (Gödel numbers to be exact), and yes there are some arithmetic truth can be said about these numbers (e.g. they can be factored into prime numbers). But how do these arithmetic relationship corresponds to properties of formula, especially, the property that we are most interested in, “provable”? This is addressed in the “Correspondence Lemma”, that every primitive recursive truth typed down as a string of symbols is a theorem of PM (deducible from axioms of PM). “Provable” happen to be primitive recursive (but I intuited that “unprovable” may not be”), and that is what really closed the loop. The omission was perhaps coming from the authors’ good intention to reduce the complexity of the proof for lay readers, but some logical holes created this way were really hard to leap over, especially for lay readers. The authors suggested in the text “we shall accept on faith” for this matter, but well, literally, it’s a leap of faith. Anyhow, I cannot yet fully wrap my mind around this proof due to limited intelligence and/or limited material presented by the authors. If I become more math-savvy one day, I will definitely read the original proof for satisfaction. The final suggestion from me is that you shall read every footnote and appendix if you are not very familiar with all the details of formal logic and don’t want to miss any important logical link. Have fun! This book is about a revolutionary mathematical paper by Kurt Godel. Godel showed that general mathematical statements could be represented using plain ol' numbers, and through this statement-to-number mapping proved that there will always exist an infinite number of true mathematical statements that are not provable using mathematical reasoning, no matter how many new rules one adds. This holds within any axiomatic system which encompasses the whole of number theory. The book dumbs down the proo This book is about a revolutionary mathematical paper by Kurt Godel. Godel showed that general mathematical statements could be represented using plain ol' numbers, and through this statement-to-number mapping proved that there will always exist an infinite number of true mathematical statements that are not provable using mathematical reasoning, no matter how many new rules one adds. This holds within any axiomatic system which encompasses the whole of number theory. The book dumbs down the proof quite a bit, and provide mathematical background for the lay reader, along with interesting intellectual history. The discussion of the proof's significance was especially interesting to me, since it dealt with computer vs. human intelligence. The original author of the book claims that Godel's proof shows that human intelligence is unattainable by a computer, since computers are themselves simply use axiomatic systems to perform more and more advanced operations. James Newman, the editor/updater, says that this is an ironically incorrect conclusion, because 1) Godel's proof shows that numbers can be used to represent any statement from any system (including whatever humans use), and 2) computers can do more than just produce true statements for proofs. I tend to agree with the original author, however. I feel I may not have understood Newman's points, because 1) Godel's paper showed only that numbers could be used to represent number theory and certain meta-mathematical statements, not other forms of reasoning such as human intellect. The crux of the paper is the demonstration of a statement that we, as humans, know to be true, but which cannot be proven true through number theory; and 2) no matter what probabilistic/cognitive model is created in a computer, the computer still follows a fixed set of axioms. The difference is only that different values are set as "true" or "false"; in other words, we might think of the deterministic output given by piece of software as the "true" statement which the program "slavishly" produces. I have pondered Gödel's famous proof since first hearing of it, but I could never manage the original paper. This compact, enlightening little gem shines a bright light on that remarkable piece of work, and on logical thinking in general. In a stunning surprise to the the status quo, Gödel shook the foundations of mathematics by demonstrating it to be incomplete or inconsistent. Hofstadter's edition with his excellent forward is particularly helpful for understanding the continued impact of Göde I have pondered Gödel's famous proof since first hearing of it, but I could never manage the original paper. This compact, enlightening little gem shines a bright light on that remarkable piece of work, and on logical thinking in general. In a stunning surprise to the the status quo, Gödel shook the foundations of mathematics by demonstrating it to be incomplete or inconsistent. Hofstadter's edition with his excellent forward is particularly helpful for understanding the continued impact of Gödel more than 70 years on. I've encountered Gödel's proof(s) in various settings -- once in a formal logic course and once in a philosophy of mathematics course. Both times I was too far in the weeds to really glean the huge importance of his work. This book does incredible justice to the intellectual masterpiece Gödel constructed, and it does so in a very incisive way. It also places his work in the context of the mathematic research at the time which gives it much more meaning. I found this book fairly easy to read with I've encountered Gödel's proof(s) in various settings -- once in a formal logic course and once in a philosophy of mathematics course. Both times I was too far in the weeds to really glean the huge importance of his work. This book does incredible justice to the intellectual masterpiece Gödel constructed, and it does so in a very incisive way. It also places his work in the context of the mathematic research at the time which gives it much more meaning. I found this book fairly easy to read with the notable exception of a few paragraphs towards the end which became very meta and hard to track. Aside from this, I think this book is very accessible to those with a moderate background in mathematics and for those, I highly recommend! This was an unexpectedly quick read. I dove right in an found it to be quite rewarding and moderately accessible. It does a great about framing Gödels Incompleteness Theorem but also introduced me to a lot of the history of logic and many important concepts. Very accessible for mathlets such as myself.